When we’re bombarded with information from every quarter as we are these days, it’s hard to tell which stories are bogus and which ones we can trust. So how do you tell fake news from real reports? Factitious can help. 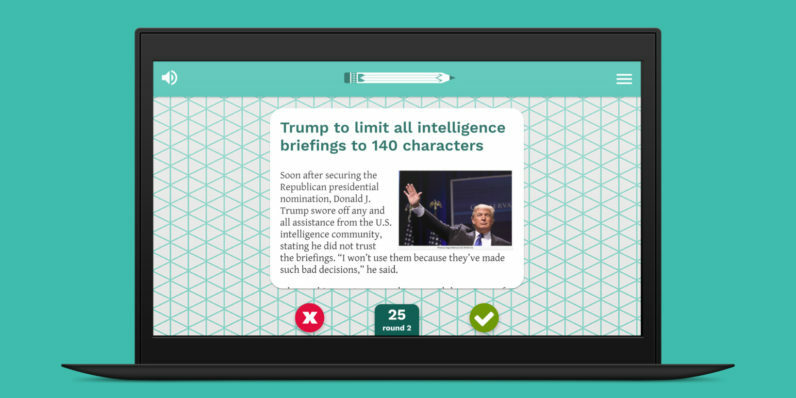 It’s a simple game from a team at American University that presents you with actual news stories, and your goal is to correctly identify whether they’re the real deal or not, by swiping or clicking left/right, à la Tinder. Generally, looking at the source of the article helps – but you might be tripped up if it’s from a genuine outlet you don’t recognize. And, as our friends at Lifehacker noted, you can also look at misinformation busters like Snopes and factcheck.org to know for sure. Think you know fake news? Give Factitious a go here.